From the New York Times-bestselling author of In Harm's Way comes a true-life story of American soldiers overcoming great odds to achieve a stunning military victory. Horse Soldiers is the dramatic account of a small band of Special Forces soldiers who secretly entered Afghanistan following 9/11 and rode to war on horses against the Taliban. Outnumbered forty to one, they pursued the enemy across mountainous terrain and, after a series of intense battles, captured the city of Mazar-i-Sharif, which was strategically essential if they were to defeat the Taliban. The bone-weary American soldiers were welcomed as liberators, and overjoyed Afghans thronged the streets. Then the action took a wholly unexpected turn. 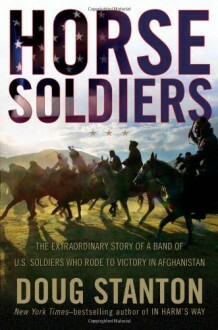 During a surrender of six hundred Taliban troops, the Horse Soldiers were ambushed. Dangerously outnumbered, they fought for their lives in the city's immense fortress, Qala-i-Janghi, or the House of War. At risk were the military gains of the entire campaign: if the soldiers perished or were captured, the effort to defeat the Taliban might be doomed. As the Americans struggled to hold the fortress, they faced some of the most intense urban warfare of our time. But until now the full story of the Horse Soldiers has never been told. Doug Stanton received unprecedented cooperation from the U.S. Army's Special Forces soldiers and Special Operations helicopter pilots, as well as access to voluminous after-battle reports. In addition, he interviewed more than one hundred participants and walked every inch of the climactic battleground. This exciting story is filled with unforgettable characters: brave Special Forces soldiers, tough CIA operatives, cunning Afghan warlords, anxious stateside soldiers' wives who do not know where their husbands have gone, and humble Afghan boys spying on the Taliban. Deeply researched and beautifully written, Stanton's account of America's quest to liberate an oppressed people touches the mythic. The Horse Soldiers combined ancient strategies of cavalry warfare with twenty-first-century aerial bombardment technology to perform a seemingly impossible feat. Moreover, their careful effort to win the hearts of local townspeople and avoid civilian casualties proved a valuable lesson for America's ongoing efforts in Afghanistan. Horse Soldiers is a big-hearted and thrilling read, with an epic story that reaches not just across the cold mountains of Afghanistan but into the homes of small-town America, and confirms Doug Stanton as one of our country's preeminent storytellers.